When you hear the word stress or see it written before you, you know what it is, right? However, if you were to define it you would probably find that your response differs from thousands of others. The official definition of stress, as per the National Institutes of Health is “how the brain and body respond to any demands.” The response is your body’s defense. Perhaps one of the most complicated results of stress is learning how to manage it and cope with it in healthy ways. Turning to drugs and alcohol will only provide temporary relief and fuel other health issues, so it’s important that you know how to cope appropriately when experiencing chronic stress. Are you a glass half-full type of person? Or, do you see the glass as half empty? As it turns out your proclivity for optimism or pessimism might just be having an impact on your quality of life. The optimistic among us are far more proficient in dealing with life’s stressful situations, which reduces how stress affects them. It’s impossible to eliminate every stressor in your life, but what you can do is develop positive coping strategies to deal with the stress that you can’t get rid of. Just remember this – the stress is your body’s response to something, not the something in and of itself. This should make it easier to identify positive coping strategies. It’s all about managing your response to the stress you experience, rather than trying to micromanage the stress that you experience. A key skill in managing stress is managing time, this means prioritizing your schedule and responsibilities, using your time wisely and making sure there is time for rest and relaxation. Do you find it difficult to say no to anyone who asks you for help, or asks a favor of you? This type of behavior could be fueling your stress directly because every time you say yes, something else is impacted. It always results in more stress, so you need to learn how to manage your time effectively and take me time without feeling bad about it. It might not be easy to strike a balance between the work, home, and relaxation parts of your life, but it’s a necessity if you want to live a stress-free life. This can be even more complicated for those who are caring for aging relatives, dealing with relationship strife, or experience financial problems. It makes it more difficult to focus on work. Whether your problem is that you focus on work too much (or not enough), when you learn how to strike a balance it will mitigate your stress and its harmful effects. There is a variety of techniques for meditation, which means you are more than likely to find one that you feel comfortable with. It not only helps to calm your racing mind, it also relieves stress. It allows you to focus your attention on breathing (or a calming image) and just be still and at peace with yourself. If you have previously turned to unhealthy coping methods don’t lose hope if you have a slip up. It isn’t the end of the world if you pick up a cigarette or have a drink, but don’t allow them to creep back in as a habit. Instead, focus on how you can regain control. Your social network provides support through the most stressful times. It isn’t a support group where you share your problems with others struggling with the same thing, it’s your friends and family. Simple things like a chat on the telephone, grabbing coffee with a friend or going out to the movies with your family bolsters your personal relationships and offers respite when you’re under stress. It’s easy to see why people slip into the unhealthy ways, they are often easier and quicker fixes, however, there are plenty of ways you can cope with your chronic stress issues in a healthy manner. They may take a bit of effort, but they are far more effective than the unhealthy alternatives. 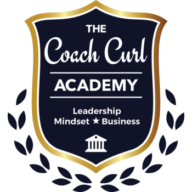 To stay up to date with the Coach Curl Academy, enter you details below.